Budgies, short for budgerigars and commonly referred to as parakeets, are undoubtedly the best known of all the world’s parrots. Great numbers of these little birds are kept as pets in many lands, and there are sound reasons for their popularity. Their delightful personalities, affectionate nature, entertaining behavior, hardiness and long lives help assure them a place in the hearts and lives of their human companions for many years. Budgies come in a wide variety of beautiful colors, frequently talk, and bond readily with humans. Because they breed freely in captivity, they are widely available at a reasonable price. The small size of these birds helps keep their care inexpensive and easy. Good basic budgie seed mixes are available in every pet store, and by supplementing this with an assortment of people food (no chocolate or avocado though), sound nutrition is assured. Budgies have an astonishing variety of vocalizations, from chirps and scolds to warbles of almost magical sweetness. Their personalities are as varied as those of people, ranging from shy and a bit timid to most impressively feisty and assertive. For the most part they get on well with other pets (cats notwithstanding) and don’t hesitate to assert their rights despite their diminutive size. In addition to the standard budgies available for a modest price in most pet stores, there is also a variation known as the English budgie. These birds are the result of many many generations of selective breeding. They are quite a bit larger and perhaps a bit more chunky than standard budgies, and they come in just as many spectacular colors. A worldwide hobby has grown up around the competitive showing of these birds where they are judged to a standard. 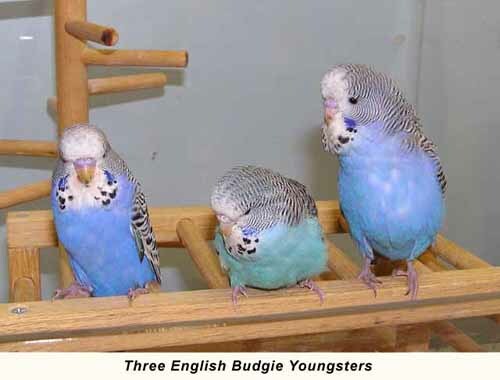 English budgies make just as wonderful pets as do standard budgies, although they are more difficult to obtain, ordinarily being available primarily from show breeders, and are usually a little more expensive than their smaller cousins. Standard (American) or English, budgies can be wonderful pets and delightful companions, not only as starter birds, but as birds worthy of a lifelong commitment in their own right.